Now that you’ve switched from ordering paper or CD publications to online ones from STP, I thought I’d share a few creative ways to make your old binders and CDs useful! If you haven’t yet made the change and you would like to, please contact our sales department (1-800-251-0381) for help with transitioning to our STP online system. For those subscribers who have been receiving more than one publication, you’ll need more than one idea and don’t worry: I’ve got you covered! I know, I know, your kids are way too cool to go to school with a binder that says, “Environmental Auditing: Federal” on the spine, but wait! You can easily cover a binder with a few trendy stickers. No need to chuck the old binder out and then head to Staples in September. Let’s all be sustainable and reuse, right? No, I am not kidding. Some of the creative minds in our shipping department discovered years ago that outdated STP CDs can be made into flashy holiday wreaths. According to Mykien Thai, you just use a hot glue gun to stick the CDs together and then add your favourite bow at the top. 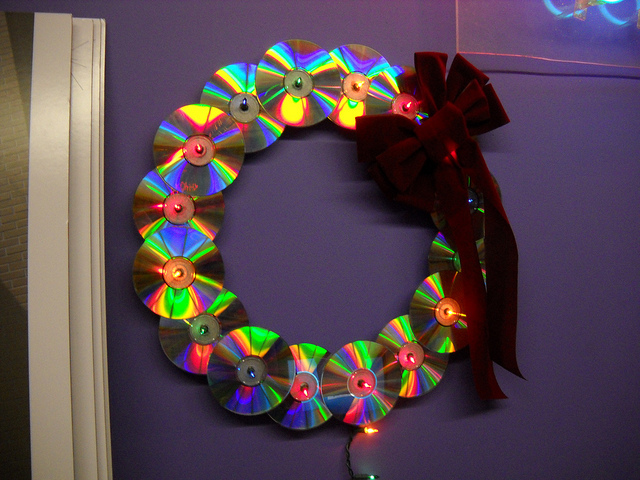 For years our editorial department has hung a CD wreath with a smile whenever December comes around. For those of you living in a home with a strata or HOA, you need to keep track of all of the printed minutes that land on your doorstep. When you go to sell your home, you’ll need to have a designated number of years of these all in one organized place and my suggestion is to hole punch your minutes as they get delivered and then plug them into your now-emptied STP binder. Unless, of course, your property manager allows access to minutes online, in which case, congratulations are in order for choosing an environmentally-minded management company. Ever notice the nice gasoline-like colors that shine on the underside of your old CD? I must say our CDs make great coasters and all of your guests will appreciate that you are not someone who likes to throw things into the landfill mindlessly. Remember the time you were out on an audit, starving with hunger, ordered pizza to the facility and it arrived uncut? Well, as long as you can wait a few minutes for the food to cool down, STP has your back. Grab an outdated environmental auditing CD and roll-on through that pizza. If your coworkers don’t find you handsome, as the title character of The Red Green Show might say, they might just find you handy. I am sure you have seen CDs dangling from car rear-view mirrors and I am not going to encourage that, as it could be distracting while driving (not to mention tacky – we do have limits), but if you are a gardener and you are trying to keep pesky birds, deer or other munchers away from your tender lettuce, you could try hanging one of these from a post in your plot. Have fun with finding new and creative ways to reuse your STP binders and CDs. Go ahead and post some of your own ideas in the comments below. Jane Dunne is a Senior Editor at Specialty Technical Publishers and she is currently working on an update of Environmental Auditing: Integrated California and Federal Compliance Guide.